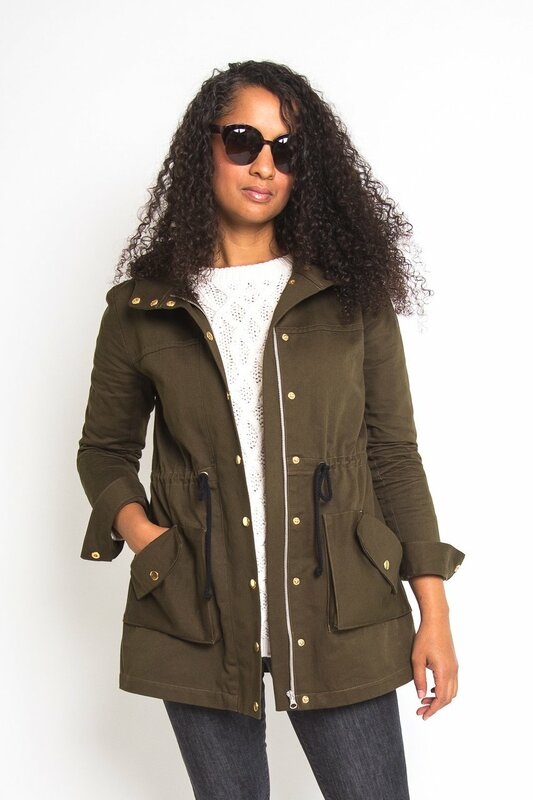 The Kelly Anorak coat from Closet Case Patterns is unlined and features a two-piece cuffed sleeve, optional drawstring waist, flap pocket with gusset, and center-front zipper closure with snap button placket. It also has the option for a hood. There is an optional pattern add-on that provides a lining pattern. Suggested fabrics include light- to medium-weight wovens such as twill, gabardine, and linen, or waterproof fabric such as ripstop or Gore-Tex. A good coat is a must in the cold winter months. Depending on how cold it gets where you live, you can need anything from a long, thick cardigan to a hefty jacket fit for a blizzard. There are plenty of coat patterns and styles, and even more options when you consider what kinds of materials are available. Some of these patterns can be adapted to work for different seasons depending on the fabric’s weight and type. Unlined coats in particular are simple to make in lighter fabrics, although you will likely need to make adjustments in size to compensate for the lack of fabric bulk. Use the pattern’s suggested fabrics to get an idea of how much drape the garment needs, and select lighter fabrics with similar drape for the best result. 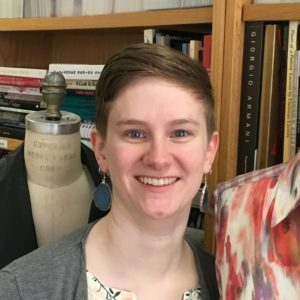 If you’ve fallen in love with a fabric that’s not thick enough for a coat, check out Mary Ray’s article, “Underlining with Fusible Interfacing” for information about how fusible interfacing can help support the fabric. “The Scoop on Linings,” by Sandi Bolton, takes you through different lining materials and how they can be used. For a thicker coat, use thicker lining fabrics such as flannel or brocade to create beautiful, warm garments. Wool is a classic coating fabric. Check out Linda Siegel’s “Wool Fabric Guide: Easiest to Most Difficult to Sew” for information about different wool fabrics. If you need help fitting the sleeves on your coats, “A Fresh Way to Fit a Sleeve,” by Kenneth D. King, first published in Threads #183 (Feb./March 2016), may be useful. “Secure a Coat Lining,” by Jacque Goldsmith, from Threads #176 (Dec. 2016/Jan.2017), explores a couture technique for securing free-hanging coat linings. Click “Launch Gallery” below to see 10 cozy outerwear options. 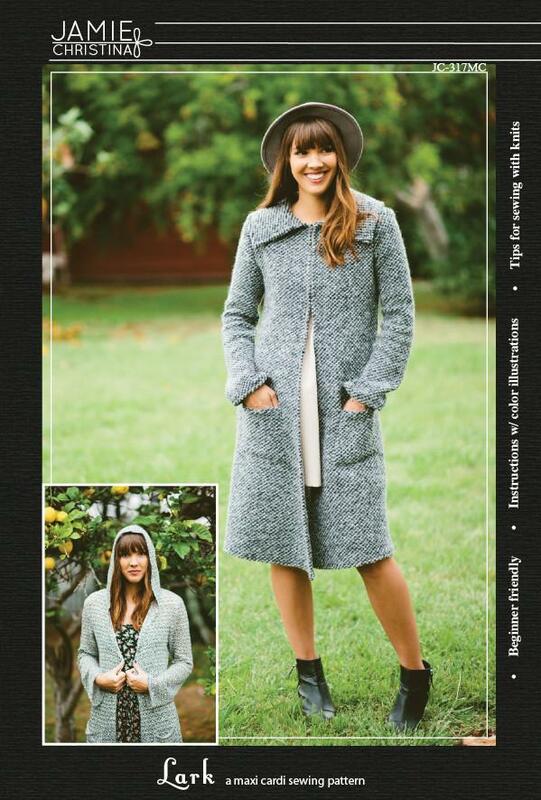 Butterick 6497 is a vintage-style lined coat with princess seams and two collar options: shawl and mandarin. It can be made hip length or knee length. Suggested fabrics include wool blends, tweed, mohair, and brocade. The Blueprints for Sewing Moderne coat is inspired by Art Moderne architecture. The drop-shoulder cocoon coat features two styles: version 1 has a knit collar and cuffs, and its curved seams are accented with piping; version 2 has a flat band collar, three-quarter sleeves, and curved side hems. Both views are fully lined. Suggested fabrics include denim for spring or wool for winter. From Deer And Doe, the Luzerne trench coat is unlined and double-breasted, with pleats at front and back and diagonal welt pockets. It also features front princess seams and two-piece sleeves. Suggested fabrics include light- to medium-weight twill or gabardine, and coated fabric. 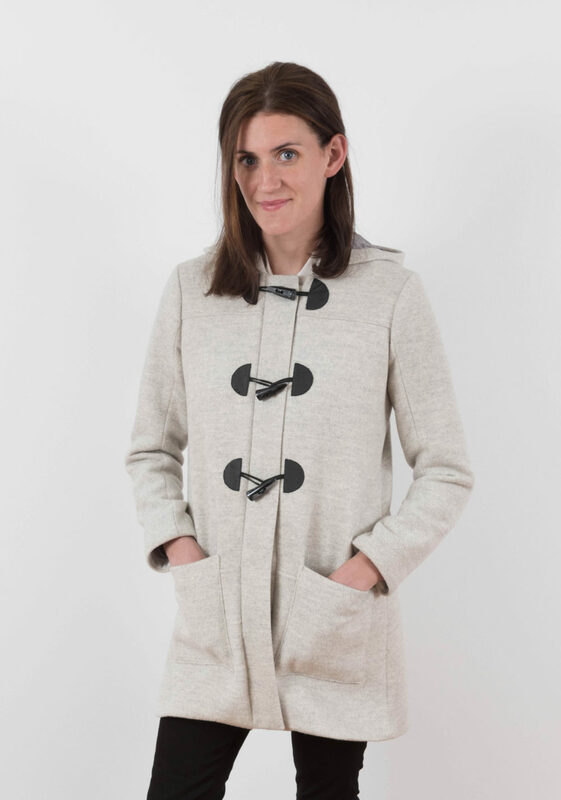 The Cascade Duffle Coat from Grainline Studio features a toggle-front closure with a hidden center-front zipper, as well as patch pockets. It can be made with a hood or a collar. Suggested fabrics include medium- to heavyweight coating fabrics such as melton, boiled, or felted wool. 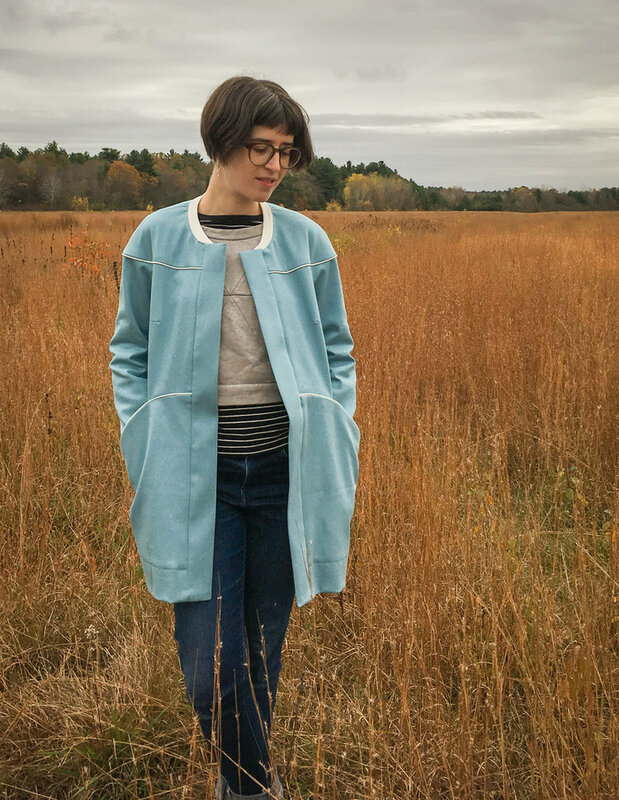 The Lark pattern from Jamie Christina is a maxi cardigan with the option of a collar or a hood. It also features patch pockets and set-in sleeves. The cardigan is suitable for knit and woven fabrics. Sew this in heavier material for braving colder weather, or lighter materials for wearing in more temperate climates. 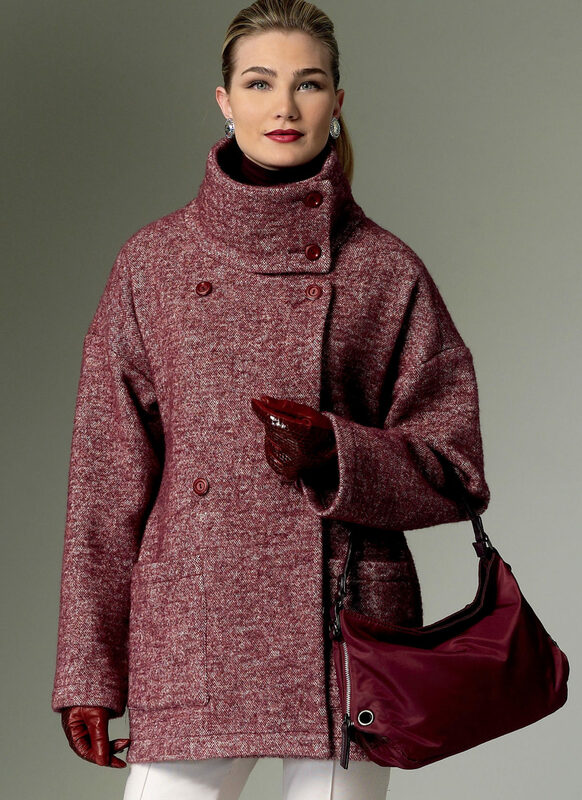 McCall's 7879 is a fitted, lined coat with sleeve and skirt variations. The coat features notched collar, bust darts, and side-seam pockets. Sleeve options include straight, flared, and bishop. Skirt options include straight and flared. Suggested fabrics are wool blends, wool flannel, and brocades. 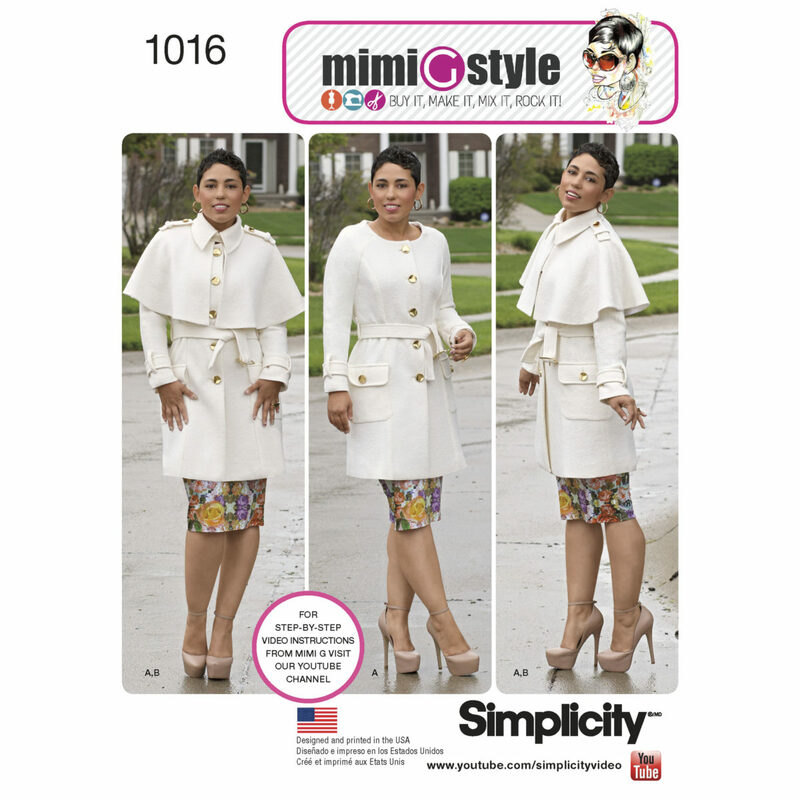 Simplicity 1016, by Mimi G., features a collarless trench-style coat with patch pockets and a removable capelet with collar. The capelet can also be worn on its own. Suggested fabrics include brocade, denim, lightweight melton, and tweed. The Coat, by The Avid Seamstress, is inspired by classic tailoring. This fully lined coat features princess seams with inseam pockets, dropped shoulder seam, notched collar, and kick pleat. Suggested fabrics include medium to heavyweight wool, wool blends, linens, and bouclé. Vogue 9136 is a loose-fitting, unlined coat with a stand-up collar, dropped shoulders, and the option of either patch or side pockets. Suggested fabrics include woolens, fleece, and gabardine.